This set of 12 cards features Chimney Rock State Park. Cards are 7" x 5", blank inside and include envelopes. This set of 12 cards features Grandfather Mountain. Cards are 7" x 5", blank inside and include envelopes. This set of 12 cards features Jockey's Ridge State Park. Cards are 7" x 5", blank inside and include envelopes. This set of 12 cards features Merchants Millpond State Park. Cards are 7" x 5", blank inside and include envelopes. 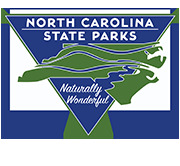 This set of 12 cards features Mount Mitchell State Park. Cards are 7" x 5", blank inside and include envelopes. This set of 12 cards (2 each) features Grandfather Mountain, Chimney Rock, Merchants Millpond, Jockey's Ridge, Mount Mitchell and Fraser Fir. Cards are 7" x 5", blank inside and include envelopes.